Tomato plants use similar biochemical mechanisms to reject pollen from their own flowers as well as pollen from foreign but related plant species, thus guarding against both inbreeding and cross-species hybridization, report plant scientists at the University of California, Davis. The researchers identified a tomato pollen gene that encodes a protein that is very similar to a protein thought to function in preventing self-pollination in petunias. The tomato gene also was shown to play a role in blocking cross-species fertilization, suggesting that similar biochemical mechanisms underlie the rejection of a plant’s own pollen as well as foreign pollen from another species. Roger Chetelat, director and curator of UC Davis’ Charles M. Rick Tomato Genetics Resource Center, and Wentao Li, a postdoctoral researcher in the Department of Plant Sciences, report their findings in the Dec. 24 issue of the journal Science. Their discovery will likely find application in plant breeding, particularly for California’s $1.5 billion tomato industry, and in developing a better basic understanding of the biology of pollination. “Flowering plants have several types of reproductive barriers to prevent accidental hybridization between species in nature,” Chetelat said. “We have identified one piece of this puzzle, a gene that helps control whether or not tomato pollen is recognized and rejected by flowers of related wild species. “Understanding and manipulating these reproductive barriers might help breeders access desired traits found in wild tomatoes,” he said. In the mid-1800s, naturalist Charles Darwin observed that many flowering plants reject pollen from their own flowers as well as pollen from foreign plant species — the first because it is too similar and the other because it is too different. They do allow fertilization, however, between two plants of the same species. In plants, as well as animals, breeding between closely related individuals is generally considered detrimental because it leads to the expression of harmful mutations and leaves subsequent generations genetically ill equipped to deal with environmental changes or diseases. And crossbreeding with individuals from different species can be equally detrimental because it frequently results in hybrid offspring that cannot reproduce. During the past several decades, scientists have studied the molecular mechanisms that cause plants to reject their own pollen. They have found that in the Solanaceae (nightshade) plant family, which includes tomatoes, prevention of self-pollination is controlled by the “S-locus.” This is a genetic region responsible for producing distinct proteins in the flower’s pollen and in its pistil, the female organ where pollination occurs. While this mechanism for preventing self-pollination has been relatively well characterized, the mechanism that prevents crossing with plants of other species is much less understood. To explore these processes in the tomato plant, Chetelat and Li set out to locate the chromosomal regions harboring genes that control fertilization and can cause a plant’s flower to reject pollen from other species. The researchers identified a gene expressed in pollen known as a “Cullin1” gene, which interacts genetically with a gene at or near the S-locus to block cross-species pollination. They found that a mutant (inactive) form of the Cullin1 protein is present in cultivated tomato, as well as in related red- and orange-fruited wild tomato species, all of which are capable of being fertilized by their own pollen. However in the green-fruited tomato species, most of which block self-pollination, the Cullin1 protein is functional. In short, their findings suggest that the Cullin1 protein is part of a biochemical gatekeeper: An active form of the protein is required for pollen to fertilize plants of another species, if that species is capable of rejecting its own pollen. While these findings are from a study of tomato hybrids, the researchers suspect that they will be relevant to other members of the Solanaceae family, which also includes potatoes, chili peppers and eggplant. As an experimental physicist, Szabolcs Márka uses data analysis and diagnostics to enhance the reach of laser equipment to detect cosmic gravitational waves. Now he is using his expertise to target something far more earthbound: the common mosquito. Márka is developing a “light shield” consisting of light barriers that can repel mosquitoes by throwing off the insects’ ability to navigate and detect humans via light and heat. His efforts have been rewarded with a $1 million grant from the Bill & Melinda Gates Foundation, one of whose missions is to eradicate malaria. The two-year Grand Challenges Explorations grant is Márka’s second from the foundation, making him one of only five grantees to receive the additional funding to continue his promising work. He was awarded an initial $100,000 in 2008. “Fundamental science—astrophysics, relativity, gravity—is like art,” says Márka, an associate professor of physics. “Is it beautiful? Yes. Is it useful? Yes, but rarely directly.” So as he advanced in his physics studies, first as a Ph.D. student at Vanderbilt University and then a post-doc at California Institute of Technology, he wondered how to apply his expertise to something that could directly help people. “I wanted to do something that improves the lives of people and is important for humanity right now,” he says. Márka is from Hungary, and he recalled that one of his college dorm mates at Kossuth Lajos University had contracted a fatal case of malaria on a visit to Uganda. He knew the impact of the disease in Africa, where it accounts for 20 percent of all childhood deaths. A father of four, Márka wondered, if he lived in Africa, how many of his children would survive early childhood. After the basic idea was analyzed with his research partners at Columbia—his wife, associate research scientist Zsuzsa Márka, and physics graduate student Imre Bartos—they started experimenting with mosquitoes’ sensory perception. The team is working to develop a device that projects a light barrier that can be strategically positioned by a bed, window or door—any place mosquitoes can hide. “Light is very easy to manipulate and shape to many geometries with optics,” Márka says. While a field prototype for the anti-mosquito light barrier is probably several years away, Márka’s team is studying variables such as shape, intensity, color and their effects on mosquitoes. Since all insects have highly developed sensory perception, Márka’s research could be applied to other insects like flies, wasps or even bedbugs. Building things and solving problems is hardly new for Márka. As a child growing up in Hungary, he constantly pestered his parents, both high schools teachers, with questions; in response, they simply handed him science textbooks. He made his first telescope from scratch at age 13, and today continues to come up with ideas and plans in his spare time for inventions that could rectify “things that are not right,” as he puts it. One example: a stroller that goes up the stairs. The motivation is part problem-solving, part fun. Researchers have developed a microfluidic device that automatically orients hundreds of fruit fly and other embryos to prepare them for research. The device could facilitate the study of such issues as how organisms develop their complex structures from single cells -- one of the most fascinating aspects of biology. Scientists know that among an embryo's first major developments is the establishment of its dorsoventral axis, which runs from its back to its belly. Determining how this axis development unfolds -- specifically the presence and location of proteins during the process -- requires the ability to simultaneously monitor large numbers of embryos with different genetic backgrounds at several time points. 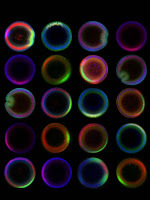 "Collecting and analyzing the signaling and transcriptional patterns of the dorsoventral axis typically requires manual manipulation of individual embryos to stand them on their ends, making it difficult to conduct high-throughput experiments that can achieve statistically significant results," said Hang Lu, an associate professor in the Georgia Tech School of Chemical & Biomolecular Engineering. To enable large-scale quantitative analyses of protein positional information along the dorsoventral axis, Lu designed a microfluidic device that reliably and robustly orients several hundred embryos in just a few minutes. Details of the device design and results from proof-of-concept experiments with fruit fly embryos were published in the Dec. 26 advance online edition of the journal Nature Methods. This project was supported by the National Science Foundation, the National Institutes of Health, the Alfred P. Sloan Foundation and the DuPont Young Professor program. Lu designed and fabricated the device with the help of Kwanghun Chung and Emily Gong, who worked on the project as Georgia Tech graduate and undergraduate students, respectively. Fabricated from polydimethylsiloxane (PDMS), the compact device is the size of a microscope slide and contains approximately 700 traps for embryos, which are shaped like grains of rice but smaller in size. In operation, fluid flows through an "S"-shaped channel wide enough for embryos of any orientation to move easily through it. The fluid efficiently directs the embryos toward the traps, while sweeping out extra and improperly trapped embryos. "The flow pattern significantly increased the frequency at which embryos contacted the traps and were loaded into them," explained Lu. "Experimentally, we found on average 90 percent of the embryos became trapped in the device, which will be valuable for studies that only have a small number of embryos available." When an embryo approaches an empty trap, it experiences non-uniform pressure and shear from the surrounding fluid. The resulting force flips the embryo vertically and inserts it into the cylindrical trap in an upright position, with its dorsoventral axis parallel to the ground. The embryo is then secured inside the trap, without any need for user intervention or control. The lock-in feature allows the device to be disconnected from the rest of the hardware and transported for imaging or storage with the embryos enclosed. 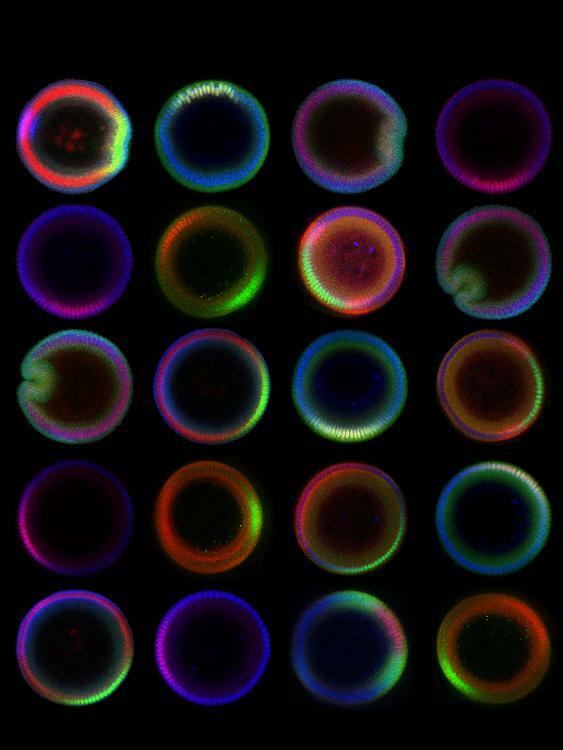 "At one point, we mailed a microfluidic embryo trap array device full of trapped fruit fly embryos to our collaborators at Princeton University, and upon arrival, the embryos were still upright in their locked traps," said Lu. To demonstrate the device's capabilities, Lu collaborated with Stanislav Shvartsman, an associate professor in the Department of Chemical and Biological Engineering at Princeton University, and his graduate student Yoosik Kim. The Princeton researchers used the device to quantify gradients of signaling molecules called morphogens in fixed embryos and also used it to monitor nuclear divisions in live embryos. In one experiment, the Princeton researchers determined the spatial extent of the distribution of Dorsal, a transcription factor that initiates the dorsal-to-ventral patterning of the Drosophila embryo. They also demonstrated that this gradient could be quantitatively compared between wild-type and mutant embryos. "The trap array device provided a significant increase in the number of fixed and live embryos we could image simultaneously and allowed us to accurately resolve issues of interest to developmental biologists today," explained Lu. In the future, scientists should be able to adapt the microfluidic device for studies of pattern formation and morphogenesis in other model organisms, such as zebrafish or worm embryos. Results of those studies will be important to the scientific community because many genes controlling development are similar in worms, fruit flies and mammals. An international research consortium has sequenced the genome of the woodland strawberry, according to a study published in the Dec. 26 advance online edition of the journal Nature Genetics. The development is expected to unlock possibilities for breeding tastier, hardier varieties of the berry and other crops in its family. "We've created the strawberry parts list," said the consortium's leader Kevin Folta, an associate professor with the University of Florida's Institute of Food and Agricultural Sciences. "For every organism on the planet, if you're going to try to do any advanced science or use molecular-assisted breeding, a parts list is really helpful. In the old days, we had to go out and figure out what the parts were. Now we know the components that make up the strawberry plant." From a genetic standpoint, the woodland strawberry, formally known as Fragaria vesca, is similar to the cultivated strawberry but less complex, making it easier for scientists to study. The 14-chromosome woodland strawberry has one of the smallest genomes of economically significant plants, but still contains approximately 240 million base pairs. The consortium of 75 researchers from 38 institutions that sequenced the genome included two Georgia Tech researchers. They are Mark Borodovsky, a Regents professor with a joint appointment in the Wallace H. Coulter Department of Biomedical Engineering at Georgia Tech and Emory University and the Georgia Tech School of Computational Science and Engineering, and Paul Burns, who worked on the project as a bioinformatics Ph.D. student. 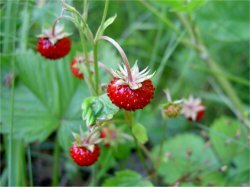 Once the consortium uncovered the genomic sequence of the woodland strawberry, Borodovsky and Burns led the efforts in identifying protein-coding genes in the sequence. Using a newly developed pattern recognition program called GeneMark.hmm-ES+, Borodovsky and Burns identified 34,809 genes, of which 55 percent were assigned to gene families. The GeneMark.hmm-ES+ program iteratively identified the correct algorithm parameters from the DNA sequence and transcriptome data. The program used a probabilistic model called the Hidden Markov Model to pinpoint the boundaries between coding sequences -- called exons -- and non-coding sequences, which could be either introns or intergenic regions. In identifying the genes, prediction and training steps were repeated, each time detecting a larger set of true coding and non-coding sequences used to further improve the model employed in statistical pattern recognition. When the new sequence breakdown coincided with the previous one, the researchers recorded their final set of predicted genes. "GeneMark.hmm-ES+ is a hybrid program that uses both DNA and RNA sequences to predict protein-coding genes," said Borodovsky, who is also director of Georgia Tech's Center for Bioinformatics and Computational Genomics. Borodovsky developed the first version of GeneMark in 1993. In 1995, this program was used to find genes in the first completely sequenced genomes of bacteria and archea. The research team then developed self-training versions of the gene finding program for prokaryotic (organisms that lack a cell nucleus) and eukaryotic (organisms that contain a cell nucleus) genomes in 2001 and 2005, respectively. Development of these programs has been supported by the National Institutes of Health since 1993. Most recently, Borodovsky's team predicted genes in the genomes of the green alga Chlorella variabilis NC64A and the mushroom Coprinopsis cinerea, with reports published in 2010 in the journals The Plant Cell and Proceedings of the National Academy of Sciences, respectively. "Our approach to gene prediction in the strawberry genome proved highly effective, with 90 percent of the genes predicted by the hybrid gene model supported by transcript-based evidence," added Borodovsky. Further analysis of the woodland strawberry genome revealed genes involved in key biological processes, such as flavor production, flowering and response to disease. Additional examination also revealed a core set of signal transduction elements shared between the strawberry and other plants. The woodland strawberry is a member of the Rosaceae family, which consists of more than 100 genera and 3,000 species. This large family includes many economically important and popular fruit, nut, ornamental and woody crops, including the cultivated strawberry, almond, apple, peach, cherry, raspberry and rose. In the long term, breeders will be able to use the information to create plants that can be grown with less environmental impact, better nutritional profiles and larger yields. "The wealth of genetic information collected by this strawberry genome sequencing project will help spur the next wave of research into the improvement of strawberry and other fruit crops," added Borodovsky. For decades, biology textbooks have been clear – our traits are the product of our genes. But a new study by Yale University researchers published Dec. 26 in Nature Genetics suggests another mechanism can regulate variations of traits even in genetically identical individuals. A particular type of RNA works in concert with a common protein to protect organisms from harmful genetic variations without the help of genes, reports Haifan Lin, director of the Yale Stem Cell Center, professor of cell biology and genetics and senior author of the paper. “This mechanism may help explain how ordinary cells such as fibroblasts can be converted to stem cells and why some cancers develop at random,” Lin said. The theory that factors other than genes are responsible for an organism’s traits, or phenotype, has been around for almost 70 years but has only gained steam in the past decade. For instance, cloned animals are often born with different colors than the animals that are the source of their DNA. But what causes these changes remained unclear. About a decade ago, scientists found that a noticeable percentage of flies lacking a protein called Hsp-90 ended up with bizarre and random abnormalities such as legs growing where eyes should be. It seemed clear that Hsp-90 protected an organism against harmful genetic variations in its genome. Yet, since Hsp-90’s role is to mobilize other molecules to respond to stress, researchers suspected other factors were involved. One school of thought suspected that Hsp-90 prevents the display of random abnormalities by suppressing the activities of “jumping genes” that can relocate to other areas of the genome and cause mutations. However, the Yale researchers report that their work with flies shows that a type of small RNA called Piwi-interacting RNA, or piRNA, acts in concert with Hsp-90 and another molecule to prevent both the creation of variants and the activation of existing genetic variants. Genes do play a role in protecting against harmful variations but probably work through actions of the molecules piRNA and Hsp-90. Lin, who studies piRNAs in reproductive cells and stem cells, says that the variations in levels of Hsp-90 and piRNAs among individual cells of the same type might explain why a small number of ordinary cells can be reprogrammed into stem cells and also why harmful mutations are created in some cancers. In a new paper published in the Proceedings of the National Academy of Sciences, Aziz Sancar, MD, PhD, the Sarah Graham Kenan Professor of Biochemistry and Biophysics in the UNC School of Medicine, and his colleagues have taken an important step in understanding the underlying molecular signals that influence a broad array of biological processes ranging from the sleep-wake cycle to cancer growth and development. Scientists who work in this field, known as chronobiology, have identified the genes that direct circadian rhythms in people, mice, fruit flies, fungi and several other organisms. However, the mechanisms by which those genes interact with light in the organism's environment have not been well understood. Circadian rhythms are the physical, mental and behavioral changes that follow the earth's 24 hour cycle, responding primarily to light and darkness in an organism's environment. About 15 years ago, Sancar discovered a human protein called cryptochrome which acts as a core component of the molecular clock in mammals. The protein is also found in fruit flies, other insects, and plants. "Cryptochrome 'resets' the circadian clock, but we were not sure how it worked," said Sancar, who is also a member of UNC Lineberger Comprehensive Cancer Center. Using fruit flies (Drosophilia melanogaster), the team purified cryptochrome and developed a biochemical test that shows when and how the protein transmits signals. "We can now detect the protein at work. When we expose cryptochrome to blue light in fruit flies, a millisecond of light exposure has a half-life during which we can examine the mechanism in the laboratory," said Sancar. "We can follow the molecular signals after light exposure and have a reliable model to test various hypotheses about how light interacts with the circadian systems we know are so important to biological processes." The research may be useful to scientists who study the circadian clock's relationship to sleep disorders, jet lag, cancer, bipolar disorder, depression and other diseases.